Before we had business intelligence, we had the bad old days of centralized information management. If you needed information, a customized report or just raw data, all you had to do was call upon the always happy to help MIS group. These guys hung out in a secluded area of the company, they spoke a specialized and obscure language and sometimes even hid behind locked doors. Appointments had to be made, justifications had to be produced and access had to be granted. Old guys who might remember this era know that it was usually a frustrating and often futile process. They weren’t always happy to help; they had their own agendas, and they were as likely to tell you what you needed as listen to you explain what you needed. If you didn’t have a clear and compelling “need to know” argument, you weren’t going to get the information you sought. Today, the problem is quite different. We have access to the data, and we are free to sample and consume it using all manner of tools. The problem today is the volume of data and understanding how to make sense of it as it relates to our specific function within the enterprise. In many cases, the data we seek is produced, stored and manipulated within the administrative tools we use on a daily basis. These tools also may provide us with some capability to distill the vast amounts of data produced into actionable business intelligence. For sales managers and marketing managers, these systems will likely include CRM and CPQ. These two systems offer specific data on customers and products. But, having the data is still not enough. In order to properly utilize the data collected, the user must understand what their needs really are and how they relate to the operation as a whole. They must determine if they are trying to inform a tactical decision-making process or a strategic decision-making process. Strategic business intelligence supports strategic processes and decisions. Marketing and Sales will evaluate higher-level questions in pursuit of the knowledge that equips them to define tactical processes more effectively. What accounts most closely align with your established marketing audience profile? This can be defined in terms of CRM-supplied data such as SIC or NAISC codes, gross annual revenue, geographical location, common pains or challenges. What percentage of your prospecting and sales effort is spent addressing this profile? Look at specific actions such as touches, time engaged, pipeline dollars and revenue per year associated with these customers. CPQ and CRM can supply much of this data. What functionality are you supplying to or enhancing for these businesses? This information is useful for R&D decisions, new product development or enhancement and engineering processes. 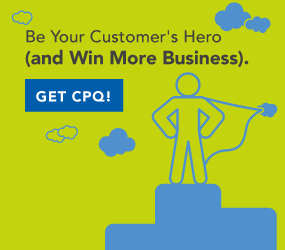 CPQ and CRM both offer relevant information in these areas. Knowing what products or options are most frequently quoted or in play during active engagements. This can help determine who is sticking with low-hanging fruit and failing to look for bigger opportunities. How effective is this or that sales rep at cross- or upselling? Similar to the first question, this helps managers determine who should lead a sales effort for a specific prospect. How sensitive is a customer type or specific customer to pricing? Do you go in high or do you lowball from the get-go? Will a last-minute price sweetener help close the deal? What reps are effective closers. Who leads the proposal team for your critical, must-have deals?• What reps suffer the least or most customer attrition? Who’s a hunter and who’s a farmer? You need both, so select your team based on the data. These are the day-to-day questions that sales managers face. All of these questions are answerable using data collected from CRM or CPQ. Your business-intelligence needs will not be fully addressed by CPQ or CRM, but learning how to interpret the data available from those systems will make a real impact on improving the decision-making processes related to management of your sales effort.